Chandra Reyes, 24, transferred from City College of San Francisco where she won Best of the Festival for her short film "Behind Shattered Glass" at the Spring 2012 CCSF City Shorts Film Festival. Photo by Godofredo Vasquez. A young woman with painted-black hair awakens inside a square, checkerboard room — and she is not alone. She is being watched by an anthropomorphic hare, a young man wearing a white waistcoat and a tall, top-hatted man who looks decidedly mad. We know this young woman’s name is Alice, but not because she has told us. We might be able to guess what is in store for Alice during her time in this place, but this Wonderland seems frightening, aloof and disinterested in her wandering. This is no typical Alice, and she is not in a typical Wonderland. This is “Behind Shattered Glass,” and it is a personal vision written and directed by SF State transfer student Chandra Reyes. Reyes has always wanted to be involved in something theatrical. From working on the sets of stage productions to directing her own award-winning short film, Reyes continues her journey of artistic expression studying film at SF State this fall. Reyes, a 24-year-old Orange County native, recently won Best of the Festival at the CCSF City Shorts Film Festival for her short film, “Behind Shattered Glass.” The film is Reyes’ personal interpretation of Lewis Carroll’s “Alice’s Adventures in Wonderland.” The film, which clocks in at nine-minutes is a monochrome, calculated and surreal waltz through a forested Wonderland, and features an older, matured Alice who seems to be in search of something lost rather than trying to find a way out. Out of more than 80 submissions to the community college festival, 10 were selected for screening, and Reyes’ film took the top prize. Reyes said she has obsessed over Alice her whole life. 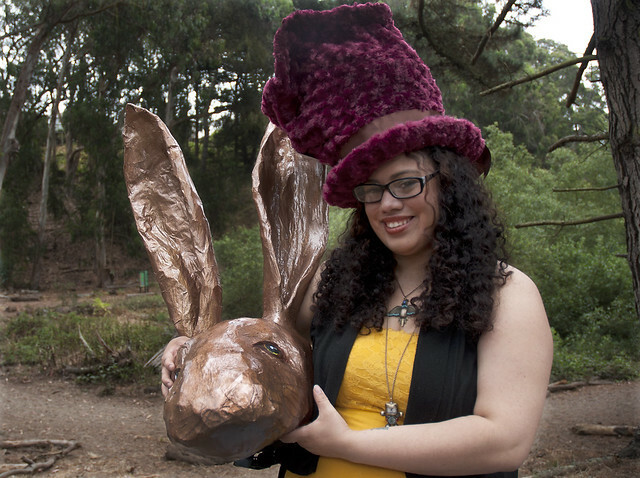 “I feel that everyone has their own take on ‘Alice in Wonderland’ inside of them, and this is my take,” she said. Chenault enjoys working with Reyes due to her focus, communication skills and demeanor. “Ask anyone in her crew and they’ll say so. She’s inspiring,” Chenault said. Reyes grew up in La Habra, Calif., where she was involved in theater until she moved to San Francisco where she has lived and studied for the past five years. She chose film as the focus of her education shortly after she enrolled at City College of San Francisco, where she graduated last spring. She will continue her film education at SF State this fall with the aim of earning a bachelor’s degree in cinema. Last semester, “Behind Shattered Glass” was produced for an advanced film production class at CCSF taught by instructor Dina Ciraulo. She was specifically worried about the special effects and technical demands of Reyes’ ideas and whether they would be realized within two semesters. Reyes does not plan on utilizing SF State for just a degree, but also for networking opportunities given the University’s reputation for producing alumni who are successful in the film business. After college, she plans on finding stable and rewarding work in the film industry and is particularly interested in film editing. But no matter her role, Reyes still plans to write and direct her own films. Reflecting on the time spent instructing Reyes, Ciraulo identified vision as Reyes’ key — and ambition her clutch. Reyes is currently submitting “Behind Shattered Glass” to various film festivals in San Francisco, Los Angeles and New York. Updates on the film can be followed on the “Behind Shattered Glass” Facebook page.